Your ultimate mineral foundation, sunscreen and moisturizer for a healthy and natural-looking coverage! This beauty balm offers a hint of color that evens and enhances skin tone. This lightweight formula provides protection from the sun’s harmful rays while creating a gorgeous, glowing complexion. Suitable for all skin types even sensitive. For normal or dry skin types, wear over purlisse moisturizers. For oily skin, wear alone. For extra coverage, wear under foundation. I 1st tried Purlisse as it came in my Ipsy bag. I fell in love with the lightweight formula and smooth feel on my skin. I would recommend this stuff for sure. I like it because it a lot lighter than traditional foundations, but found it a bit dry. Added to my moisturizer it spreads on nicely. 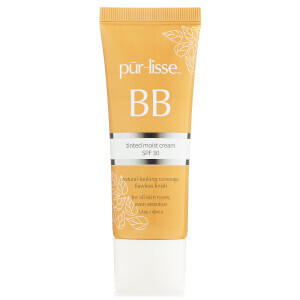 Once upon a time, I received a tiny sample tube of this BB cream in an Ipsy bag. I immediately fell in love with it. I don't like using heavy product on my face. I like to let my freckles show ;) This cream is so light and it truly is moisturizing. It stays put all day but you forget you're wearing it. A little goes a really long way. I would use a pea-size amount for my whole face. My tiny little sample tube lasted me a couple months. Now I'm ready to stock up on some full-size tubes. This is the only BB cream I will ever want to use for the rest of my life.